This includes the Medi-foam Kit (Orthotics casting box) . Please pay $20 dollars now for the shipping of the casting box (no additional shipping and handling), and pay the balance upon return of the casting box. Optional replacement program available for an additional cost at time of original purchase only. Need a second pair of orthotics? E-mail us for our second pair special. Original Clients Only. $17.95 per pair or 2 pair for $30.00 plus $6.45 S&H. Colors available: flesh tone or black. For correct size trace around your orthotic and send with order. Note: Our covers are designed to fit our 3/4 length semi-rigid orthotics. They will not fit other brand full length orthotics. 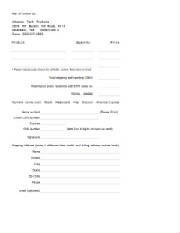 Clients wishing to submit a claim using their O.R.P (the optional replacement program is good for 1 pair only) simply print the order form, write "ORP claim" in the product line and mail with payment. The Co-pay is $100 plus S&H. Add $25 if you would like to re-purchase the O.R.P for your new pair. If your old orthotics fit well and you purchased your orthotics from us within the last four years at an event, we will be able to use your original fit data for another pair. If we do not have your original fit data please call or e-mail us for a casting box. For phone orders please call us at (360)307-0890.